RoadRush is a digital platform made for motorbikers, by motorbikers. As a rider, have all your instruments readily at hand from discovery to planning and riding right down to review. All in one place, at all times. Roadrush is a from-the-scratch MVP we built together with the founders. We’ve been part of the process since early ideation and scoping workshops, through market research, systematic design phase, to early prototyping and very agile development, all in an intimate collaboration with Regina and Georg. How do you plan your next ride? Word of mouth, Magazines, travel books and websites, forums and Google maps, and once on the road GPS, a printout and guide books? RoadRush was founded by two motorbikers, who think there is a better way. A companion, digital, robust and swift, one that will stand by your side through all the phases of your journey and take you to your uncharted territories. RoadRush is a desktop and mobile app. 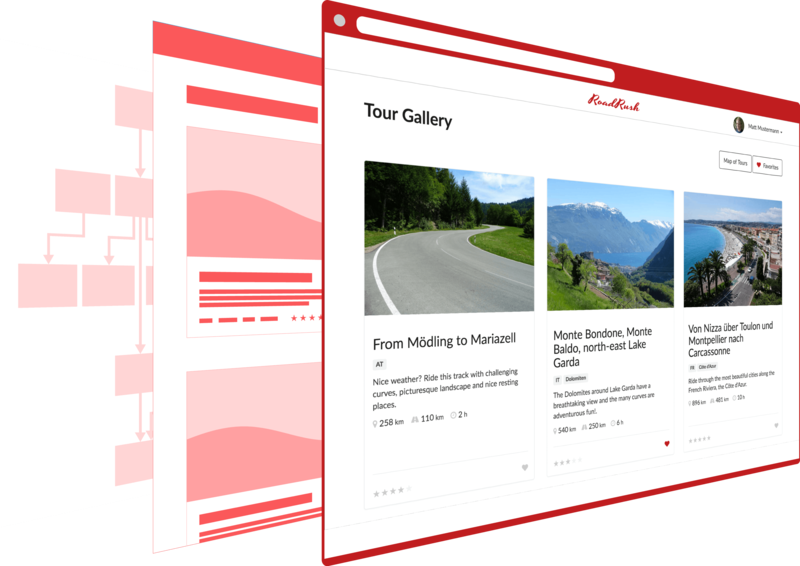 It combines your pre-ride research and discovery through curated tours across Europe, with your feasibility assessment and planning using key tour data, to then get you on the road to your destination with a live ride view. Once you have reached your goal, make the most out of the community’s strength: review the tour, to help other riders in their decision and yours on other tours. Going from the idea of RoadRush to the actual product was exciting and challenging! It was a true competitive advantage having Sleighdogs on my side. The pack’s guidance and boost helped me as a founder to weigh a vision against user insight to get the absolute minimum product. The highlight for me was going as fast as possible to prototyping and then adapting features and design to the „real life“. It was the most efficient process I have experienced. Sleighdogs are hands on, thinking holistically and acting on all sides. True partners. Drive your tour without second thought. The web application offers the possibility to push a selected tour to your mobile app, so you are ready to ride as soon as you switch your mobile phone on.